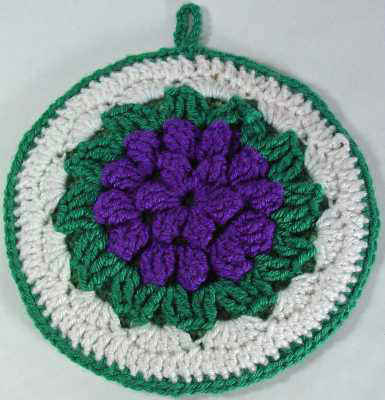 Materials: Worsted Weight Yarn; Purple (P) – ½ oz, 28 yd (14 g, 25 m); Green (G) – 1 oz, 55 yd (28 g, 50 m); White (W) – ½ oz, 28 yd (14 g, 25 m); Yarn Needle. Crochet Hook: Size I-9 (5.50 mm) or size needed to obtain gauge. Gauge: Rnd 1 = 2 ½” across. Beginning Popcorn (beg-pc): Ch 4, 4 tr in st or sp indicated, drop lp from hook, insert hook from front to back in 3rd ch of beg ch-3, pick up dropped lp, pull through lp on hook. Popcorn (pc): 5 tr in wt or sp indicated, drop lp from hook, insert hook from front to back in top of first tr, pick up dropped lp, pull through lp on hook. Rnd 2: Sl st in ch-4 sp, (beg-pc, ch 4, pc) in same sp, ch 4, (pc, ch 4, pc) in each ch-4 sp around, ch 4; join with sl st to beg-pc. 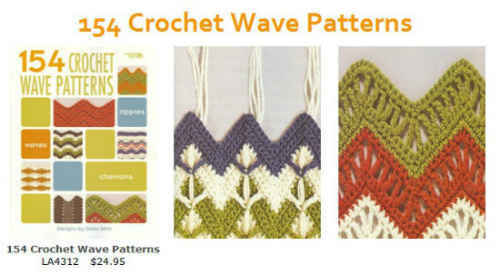 (12 pcs) Finish off and weave in ends. Rnd 5: Ch 3, dc in each of next 4 sts, 2 dc in next st, (dc in next 5 sts, 2 dc in next st) around; join. (84 dc) Finish off and weave in ends. Rnd 7: Ch 3, dc in next 4 sts, 2 dc in next st, (dc in next 5 sts, 2 dc in next st) around; join. (84 dc) Finish off and weave in ends. With wrong sides together and Front facing, working through both sides at the same time, join G with sc to any st, ch 15, sl st in sc just made (hanger made), sc in same st as joining, work 88 sc evenly spaced around; join with sl st to first sc. (90 sc) Finish off and weave in ends.